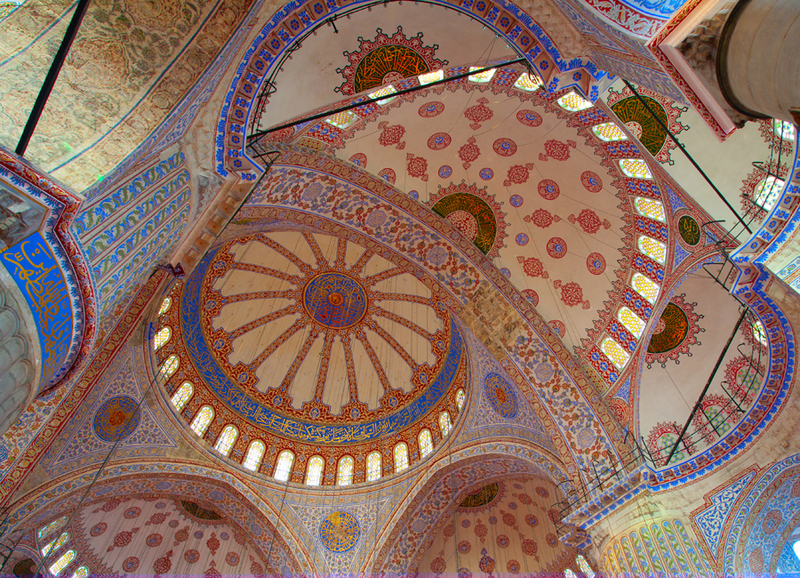 Visit the Blue Mosque (closed on Friday Mornings), famous for its mosaics of blue Iznik tiles and its six minarets. Facing the Blue Mosque is St. Sophia (closed on Monday in Winter months replaced with Yerebatan Underground Cistern), one of the great architectural marvels of the ancient world. This church – turned mosque – and now a museum, takes the breath away with the sheer size of its interior and its magnificent dome. Cross through the Hippodrome, the scene of Byzantine chariot races, athletic events, victory celebrations, and political activities of the old city where one can also see the Obelisk from Egypt, Serpent Column from Delphi, the Fountain of Wilhelm II and the Colossus. In the afternoon, explore the spectacular Topkapi Palace (closed on Tuesday), seat of the Ottoman sultans for 400 years. Built on one of the seven hills of Istanbul, this huge complex commands superb views of the Sea of Marmara, the Bosphorus and the Golden Horn. The palace is filled with treasures of the Sultans including the extravagant Treasury with its magnificent jewels, and the priceless Chinese porcelain, one of the best collections in the world. Then proceed to Grand Covered Bazaar which is the biggest “souk” in the world with nearly 4000 shops of antiques, jewelry, gold, carpets, ceramics and leather wear. Please note: Grand Covered Bazaar can be replaced with Underground Cistern on Private Tours. The Underground Cistern with its atmospherically lit rows of columns – 336 in total. It was built in 532, with a capacity to store 80,000 cubic metres of water. It has excellent acoustics, and, with its fabulous atmosphere, has been used by famous singers, and for film sets. Please note: as the Underground Cistern is very old and damp, appropriate footwear is advisable as the floor can be slippery. Full day 9 a.m. – 5 p.m.